This sight is of exceptional quality and comes with its fair share of benefits over other sights available on the market. Each of its features is useful and make this sight a great option for hunters who want something simpler to use than just the standard iron sight. Reflex sights are becoming increasingly popular among hunters and gun enthusiasts, and this product will satisfy almost any customer. Here are all of the features of the Vortex Razor Red Dot Sight and how they can benefit users of this product. Wide field lens: The durable lens on this sight is wide and easy to use. It is designed to be resistant to scratches, so users don’t have to worry about the most important part of the sight taking unnecessary damage during use, transport, or storage. Additionally, the lens is protected with an anti-reflective coating, making the high-resolution display easier to see in any possible condition. All of these lens features ensure that vision remains unimpaired during use of this sight. Red dot: The red dot illuminated by this sight is brighter than most and also more accurate, so users can see it easily even in sunny weather. The brightness is adjustable with nine different levels, so it is easily customized to the user’s preference or weather conditions. The dot can be seen clearly in the day as well as night, and shouldn’t be affected by foggy weather so hunters can use it whenever they desire. Aluminum chassis: The chassis of this sight is constructed with an aircraft-grade aluminum alloy. It is extremely durable and will last for years to come, regardless of how often it is used or what conditions it is exposed to. The aluminum alloy is chemically treated to be scratch resistant and far more durable than all the other metal options available. It was built to resist damage and to withstand recoil as well as impact. O-ring seal: This sight is sealed with an o-ring for an extra layer of protection from the elements. The o-ring seal keeps out water and dust so that the display lens and red dot are unaffected. This allows for the ability to use the sight completely worry free and get dirty when necessary on the hunt. 6-hour automatic shutdown: If users forget to turn the sight off after they use it, an automatic shutdown feature will kick in after the sight has been on for a consecutive 6 hours. This will conveniently save on battery life so that users don’t get stuck without their sight the next time they need it. At the sight’s highest setting, it has a 150-hour run time. Easy to use: This sight is exceptionally easy to use, even for beginners. The two arrow buttons sit on top of the sight, directly behind the lens. Holding either arrow will make the sight power on, and then the arrows can be used to adjust the brightness of the red dot. Holding either arrow again will power the sight off. Included Picatinny mount: Vortex includes a Picatinny mount with this sight, so it can easily be attached to whatever gun the user prefers. It is an unavoidable fact that any product on the market comes with at least a few drawbacks. 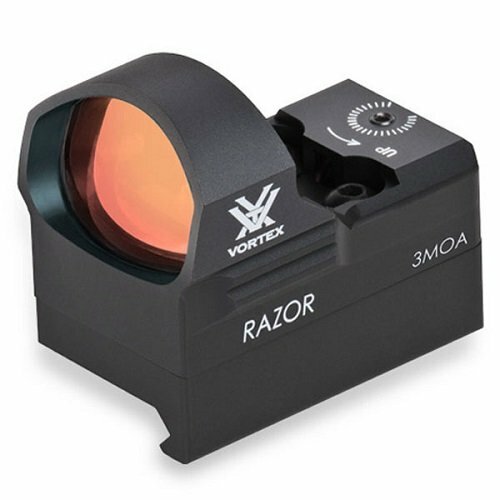 While the Vortex Razor Red Dot Sight is no exception to this rule, the benefits of all its included features far outweigh any negatives listed. Here are the drawbacks to consider before buying a Vortex Razor Red Dot Sight. Sight adjustment with Allen key: Unlike some sights that can be conveniently adjusted with a coin, this sight requires a metric Allen key. This is only a small inconvenience, but it could possibly be bothersome to buyers used to the coin option. Power-on delay: The arrow button on the sight must be held for a few seconds before the sight powers on. While this should be fine for most hunting applications, buyers who use their guns and sight for self-defense might find this delay dangerous and inconvenient. This sight is a high-quality option for hunters and gun enthusiasts who prefer the red dot sights over the standard iron sights. It has the durability and high performance necessary to satisfy experienced sight users while remaining easy enough to operate for hunters who are new to reflex sights altogether. The benefits of this product place it well above many other red dot sights on the market, and it has a place in just about every hunter and enthusiast’s collection. The only people who might not get the most out of this sight are those wishing to use it for self-defense purposes rather than hunting. The power-on delay could cause an issue in this situation only.